From settlement in 1788 to 1859, Australia depended on units detached from the Royal Navy based in Sydney to provide naval defence. In 1859, Australia was established as a separate British Naval Station, until 1913. In 1909 discussions were held between the British Admiralty and the Australian government which resulted in the establishment of an Australian Fleet. 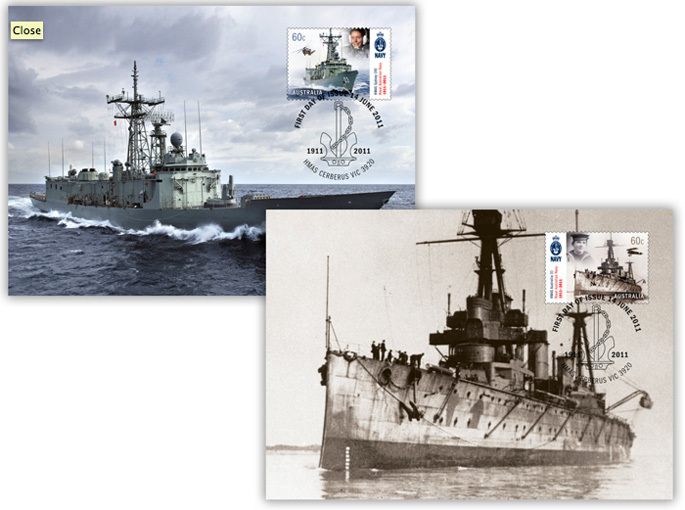 The Commonwealth Naval Forces was granted the title "Royal Australian Navy" on 10 July 1911, and by October formal control of the Navy was handed over to the Commonwealth Naval Board. 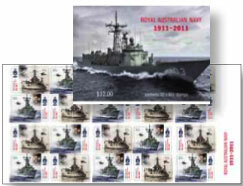 This issue has similarities with the Australian Army issue of 2001 - two stamps, one showing historic images, and the other contemporary images. The two designs were also included in a self-adhesive booklet. 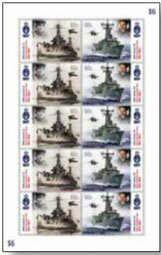 Two maximum cards showing the ships on the stamps will accompany this issue.